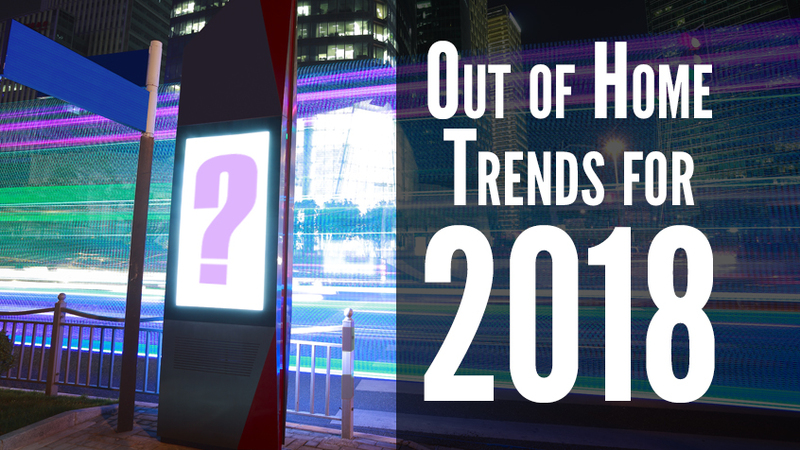 With 2018 fast-approaching, I see a number of key trends that will continue to dominate the Out of Home (OOH) industry. 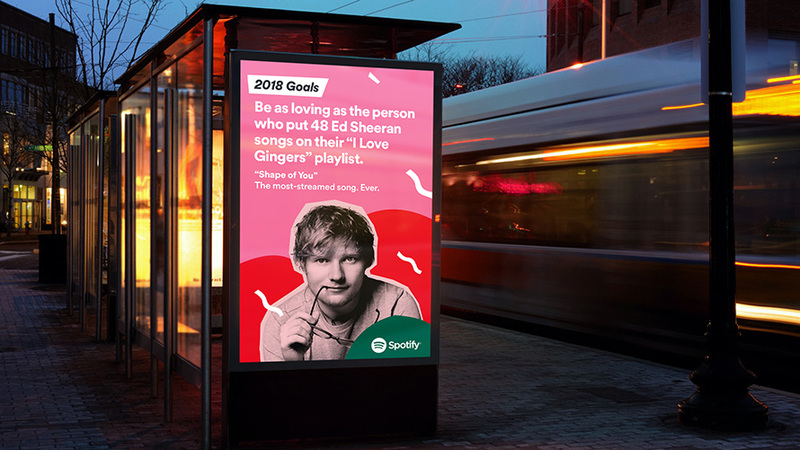 This year, OOH has seen solid growth as a part of the media plan, moving from 5-7% spend on average, according to a new online activation study released by Nielsen. Big data, digital strategies, location and audience analytics will continue the rapid transformation of the Out of Home media landscape, changing how advertisers plan, buy, and deliver creative. 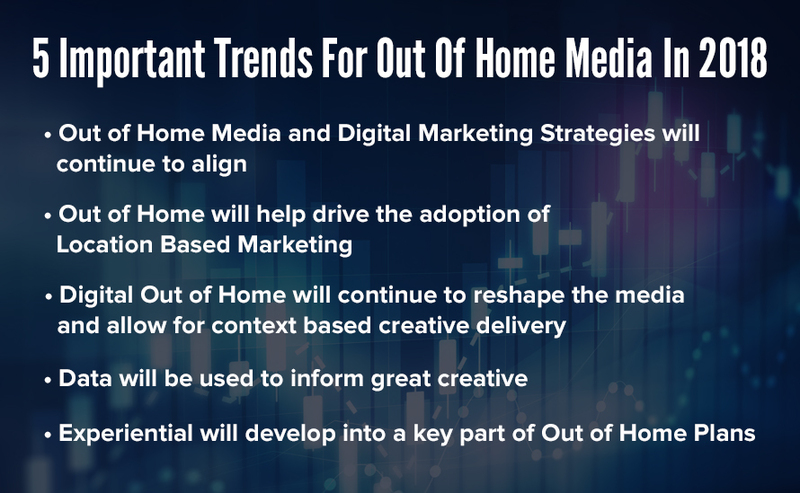 As new measurement techniques and integration with digital channels come online, they will continue to add to the value proposition for Out of Home, making it an even stronger component of a robust media plan. Marketers are becoming increasingly aware of how the worlds of Out of Home and digital media overlap. Combining the two as part of an integrated strategy can strengthen both. Analysis of digital media can help inform OOH planning. Out of Home (by way of geofencing and other interactive tactics) can help focus digital efforts, and bring more focused audiences into the advertiser’s digital ecosystem. Integration of digital marketing strategies with Out of Home can multiply impressions to a pure plan. By way of the smartphone, individual behavior and demographics are being mined and combined to deliver stronger metrics to the advertiser, with the end game of creating media plans that are more targeted and contextually relevant to the consumer. The two generate stronger recall because the virtual message has been better informed by the consumer’s daily habits, in and outside the OOH grid. Geofencing and other digital tactics applied to Out of Home provide real-time data that can be quickly sifted, evaluated and reused as actionable intelligence for future campaigns. For instance, Walmart ran a campaign using real-time data to identify shopper moms and the digital OOH locations they passed. By geofencing the OOH sites, the mobile data generated consumer information for better marketing at the point of purchase after exposure to Out of Home media. Combined with geo-local digital strategies, OOH media will experience growth as a core component of a personalized advertising strategy, reaching the individual at the most relevant time and place. During a busy day, when we are interested in a product/service, we actively search on the most convenient device, most likely the smartphone in hand. According to Google, 76% of people who search for something nearby on their smartphone visit a related business within a day. With its localized nature, Out of Home can help drive that behavior. Every day, we are intersecting the path of OOH, which provides a personal touchpoint, builds interest and helps drive digital engagement. Notably in Nielsen’s most recent report, Ads Driving Online Activity 2017, “While OOH media accounts for 26 percent of gross search activations generated by television, radio, print, OOH combined, but it only accounts for 7 percent of the total combined advertising spend. Personalizing the message invites a direct response in that moment, via search, sharing, action, etc, similar to digital advertising’s immediate response mechanism. The benefit to the consumer who is consistently on the go, wired and looking for instant return, is the personalized ad experience. This revolution is in its infancy; however, it will continue to evolve and become more unique as data is gathered and reformulated to be relevant to an individual’s journey. The “phygital” aspect of the combination strategy is powerful. By combining the digital data collected with the physical time and place, personalized advertising breaks through the ad clutter allowing brands to make a powerful connection to their audience. Outsmart/UK Digital disclosed that Digital Out of Home (DOOH), “now accounts for 45% of all Out of Home revenue… This reflects the ongoing conversion of premium Classic Out of Home sites into Digital as well as the development of new, state-of-the-art digital inventory.” The trend is clear; media owners will continue to digitize premier locations into ones that leverage the capability with real time info, networking, interaction, day-parting and rotating messages, just to name a few. Whether you find them in airports, along the highways, in malls, stadiums or just about anywhere else, digital signs pair well with the smartphone in your hand. Digital Out of Home aligns with the always on screen activity of the smartphone generation, providing a path for more personalized and interactive advertising in real time. Engagement on so many levels with digital OOH gives the power back to the individual. It is no longer a one way message pushed at the consumer; rather, the consumer can now pull in relevant information, by seeking, engaging, promoting or acting. With the social media world in hand as well, the reach is extended and the message is amplified via sharing, potentially exploding into the live stream for millions worldwide. One of the biggest trends that holds so much promise for OOH is the creative options brands seek. We all know that great creative breaks through the noise, resonates with the viewer, becomes part of the lexicon and emotionally connects. The growth of business intelligence will do more than just inform Out of Home planning – it will also help drive great creative. Stay tuned, there is more where that came from…smart communities, smart media, interactive creative, selfie crush…the synergy is building and impressions are amplified from the ground to the screen, on the phone, on a sign, to social media sharing…look for more socially driven creative campaigns going forward. The next generation is looking for an experience that can include entertainment, learning, or cause-based programs. By tapping into this demand, experiential campaigns are being considered now more than ever before. Experiential programs create one-on-one engagements, allowing brands to deliver a personal message effectively, turning guests into brand ambassadors. More brands are investing in, sponsoring, and creating content around events, employing people, branded wheels and signage to create a memorable experience. The growth of Augmented Reality (AR) & Virtual Reality (VR) expands the creative potential for experiential activations, can serve as stand-alone experiences, or create content, with viral buzz as an immersive, memorable moment that will get shared on social media. As these technologies evolve over time, they will become a more cost effective and scalable part of innovative experiences. Not to be overlooked, experiential activations also provide natural entry points into an advertiser’s digital ecosystem. Geofences and other means of digital engagement can extend the reach of the experience by drawing the audience to the event, generating direct signups or tagging participants for retargeting at a later time. Malls offer an interesting opportunity to design an immersive and interactive environment with store sales supporting the experience. Check out Samsung 317 for a peek into future things to come in the retail space. There is no doubt greater consideration is being given to OOH and this upward trend will continue because of its versatility, creativity and adaptability. Since it is a low-cost media option and offers limitless creative choices, it offers digital marketers an opportunity to take their reach to a new level by driving online activation and ROI far better than in the past. And its ability to drive or support social media engagement and personalize the message through one-on-one experiences makes it one of the best partners in a robust media plan. OOH has a great runway in 2018 with many signs pointing to solid growth in the new year. 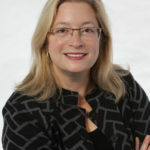 Betsy's passion is to drive the success of collaboration, for the mutual benefit of all. 1 + 1 can equal 3 when all parties contribute towards a bigger goal. Betsy enjoys good food, good company and a good sense of humor!